But the measure, culminating the GOP’s seven years of pledging to repeal President Barack Obama’s health care law, encountered turbulence from two influential Republican governors and the nation’s largest doctors’ group. 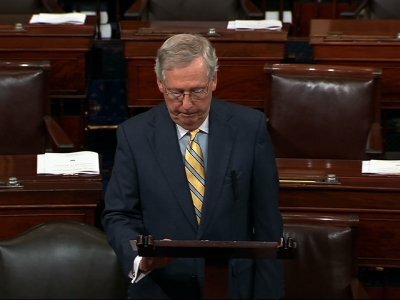 That complicated Senate Majority Leader Mitch McConnell’s task of preventing even a single additional GOP senator from rejecting the legislation, which would kill it. “After all of these years of suffering thru ObamaCare, Republican Senators must come through as they have promised!” the president tweeted before departing Paris, where he attended Bastille Day ceremonies. McConnell, R-Ky., refashioned the legislation to attract GOP votes, two weeks after retreating on an initial version that would have died for lack of Republican support. The new package added language letting insurers sell discount-priced policies with minimal coverage aimed at winning over conservatives, and revised funding formulas that would mean federal money for states including Louisiana and Alaska — home to four GOP senators. Fifty of the 52 Republican senators must back the bill in an initial vote McConnell plans for next week or, facing solid Democratic opposition, it will lose. GOP Sens. Susan Collins of Maine and Kentucky’s Rand Paul have said they’ll vote “no,” leaving McConnell no wiggle room. Trump’s team tried winning over Republican Nevada Gov. Brian Sandoval, who’s said GOP proposals to cut the Medicaid health care program for low-income people would unacceptably hurt the state. Sen. Dean Heller, R-Nev., facing a difficult re-election battle next year, has taken the same stance, and Republicans believe one pathway to Heller’s vote is through the popular governor. Sandoval told The Associated Press that McConnell’s latest measure has Medicaid cuts that remained “a big concern for me.” He said the bill had money states could use to mitigate those reductions that “could be a good thing,” but said he needed more information. The bill would halt the extra money Obama’s law provides for states that expand Medicaid, which Nevada has used to add 200,000 beneficiaries to its program, and curtail its future growth. Sandoval said he expected to meet privately with Vice President Mike Pence and Health Secretary Tom Price at governors’ meetings he is attending in Providence, Rhode Island. He said he’d already heard from both men. Further complicating McConnell’s effort, Ohio GOP Gov. John Kasich called the revised measure “still unacceptable,” largely because of its Medicaid cuts. That’s a concern also voiced by another Senate holdout, Ohio Republican Rob Portman. Like legislation the House passed after its own struggles, the Senate bill would get rid of Obama’s mandates for individuals to buy insurance and for companies to offer it and repeal many of its tax increases. The rewritten package would add $70 billion to the $112 billion McConnell originally sought that states could use to help insurers curb the growth of consumers’ out-of-pocket costs. And it has an added $45 billion for states to combat the misuse of drugs like opioids. McConnell has several factors working for him. On his side is enormous pressure on Republicans who’ve campaigned on repealing Obama’s law since its 2010 enactment. He faces few constraints about the bill’s contents from Trump, whose descriptions of what he wants have ranged between vague and contradictory. And he can craft the legislation to appeal to senators. Underscoring that, the measure would change two formulas to funnel more money to states that expanded their Medicaid programs since late 2015 to additional people. Democrats said the revisions seemed particularly aimed at helping Louisiana, home to two GOP senators: Bill Cassidy and John Kennedy. Kennedy said the “unfair treatment” under McConnell’s original bill would have cost the state $2 billion. The revision also seemed likely to help Montana and Alaska, represented by three Republican senators and one Democrat. Also increased is money that would flow to some hospitals in states that chose not to expand Medicaid, which are largely run by Republicans. Chris Sloan of the consulting firm Avalere Health said the change would be a significant benefit to large states including Florida, Texas, Georgia and North Carolina. The new bill would also set aside up to an additional $2 billion for helping insurers limit consumers’ out-of-pocket expenses in Alaska, home to two other Republican senators. Associated Press writers Ricardo Alonso-Zaldivar in Washington, Jennifer McDermott in Providence, Rhode Island and Julie Carr Smyth in Columbus, Ohio contributed to this report.